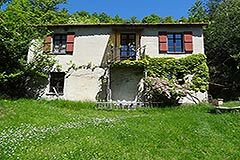 Two Langhe Stone properties for renovation in Piemonte Castino Langhe Hills (ref: 8114)- Langhe Stone Houses surrounded by 120000 sqm of land, perfect restoration project.. Piedmont Properties in Piemonte. Property for sale Langhe and Piemonte. Map for Property ref: 8114, Two Langhe Stone properties for renovation in Piemonte - Langhe Stone Houses surrounded by 120000 sqm of land, perfect restoration project.